The stars express my own subjective point of view! They represent usefulness and overall coolness of the particular script. A Tutorial based on sample code developed during the MAXScript Course at the Filmakademie in Germany. Contains the final scripted plugin. R3 COMPATIBLE. Lets you reorder the lights in the scene to define the first 8 lights used by Max and OpenGL in the interactive viewports. Lets you automatically jump to BaseObject level, a specified modifier or a user-defined level on the modifier stack when selecting an object. 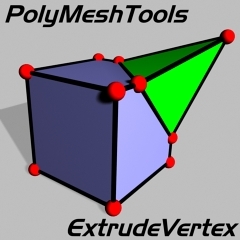 Same as "Ignore Visible Edges" in EditableMesh, but for EditablePoly. Drag "SelectCoplanarPoly" from "Bobo_s Tools" category to the Quad of your choice. Select EPoly, go to Face sub-object level. Select one or more polygons. Right-click to get to QuadMenu, select the  icon to open the options or select the "SelectCoplanarPoly" to select with default threshold of 0 degrees. The options dialog is modeless and can stay around while you work with the script. There you can set your Angle Threshold from 0 to 180 degrees. The threshold will be valid for any subsequent calls to the "SelectCoplanarPoly" script during this scene & max session. (Adjust once, use many). The script will be enabled/visible only when an EPoly is in sub-object face level mode. Pressing SELECT in the dialog while not in that mode will do nothing. Magmapulators is a set of scripted Manipulator plug-ins and a Scripted Utility. It contains modules with multiple Manipulators for Geometry, Shapes, Modifiers, Cameras and Lights and a utility for toggling any manipulator on and off. Perform complex search operations by combining multiple Queries. Apply Select, Select More, Unselect, Hide, Unhide, Freeze, Unfreeze actions to the filtered objects. Save the Search Queue to disk and use the Presets later. TopCAT is an scripted modifier that will let you expose properties of objects and modifiers on top of the stack. It creates Custom Attributes and wires them automatically to the original parameters. Define sets containing multiple Triggers and Reactors. Define multiple Reactions controlled by the Triggers' selection incl. Hide, Freeze, SeeThru, BoxMode and Backface Culling. Manage the sets, enable/disable, rename and delete them. NEW in 0.31: Fixed a bug preventing objects with special characters in the name from working with the script. When a Trigger object is selected, all Reactors will be changed according to the defined reaction. This way you could for example turn on SeeThru of the Skin mesh when bones are selected or hide the rest of the body when a specific body part is selected... Reduces the trips to the Display tab/floater to Hide/Unhide scene elements. NOTE: This is a pretty specialised script for checking/unchecking the map slots only. FindMapPath is a simple search engine that can help you localize objects using certain bitmap names and paths. NOTE that it provides a small subset of what COLUMBO does, with the added feature of printing information to the Listener. It was requested on the MAX Support Forum. Logolisator is a simple RenderEffect that will emboss an external image file on top of your rendering. Blending options include Alpha Blend, Blend, Add, Subtract, Multiply, Value Add, Overlay, Softlight and Hardlight. Abort the operation and return to otriginal state with RMB if desired. Source Camera can be freely animated without any limitations. Scene Time slow-down and speed-up controlled by a Bezier Float function curve in TrackView. Optional clamping of negative values for single-direction time flow. Both scene segment and user animation segment supported.. Select Vertices, Edges or Faces on the one side of a model and manually or automatically select the symmetrical elements on the other side. Control the speed vs. precision parameters of the fast search code. A Point3 and separate X,Y,Z values with own Min., Max. and Default values and Snaps. User Colors can optionally overrule the default colors. User Colors can be copied from other custom Manipulators. X and Y values with own Min., Max. and Default values. Auto-Center option resets to Default on release. User Colors can be copied from other Joysticks, Spinners, SuperSliders or Dials. Reset Spinner to Min, Max and Default value by clicking on ticks. User Colors can be copied from other Spinners, SuperSliders or Dials. New User Snaps similar to the WinWord Tabs let you snap with a specified Strength or by just clicking on the Snap Tick itself! Useful for predefining values on Morph Sliders or resetting. Both User Snaps and User Colors can be copied from other SuperSliders, Spinners or Dials. Dial Manipulator is a clock-like manipulator similar to the SuperSlider. Min and Max value meet at the right side. The value goes clockwise from Min. to Max. User Snaps let you snap to the Min value or one of the 3 User Snaps either by clicking on the ticks or interactively using the Snap with definable Strength. Can copy User Colors from other Dials, Spinners or SuperSliders. SelectByTargeObject does the inverse of "Select Target" in the Lights/Cameras QuadMenu. Select a single TargetObject and use the script to select its "master". In the current version, only the "master" will become selected. By default Uses "MaxColors.CLR" as template. Another 3ds max 4 CLR file can be picked as template. New 3ds max 4-specific colors will be taken from the template file. Prints detailed progress info in the MAXScript Listener. Creates a copy of a source object and instances all or only some of its properties. Uses Instanced Controllers by default for speed when the value is passed between instances without changes. Can use Wire Controllers to allow later editing of the instancing using more complex expressions. Provides an offset option to create an array of copies along any world axis. 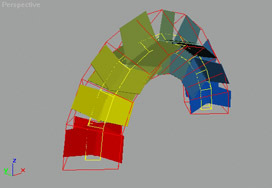 FinSize enables and and tries to resize Bone Fins based on the size of a selected mesh (Skin). AllFinsToggle turns all Fins in a Hierarchy of Bones ON or OFF. SelectAllBones selects the whole hierarchy of a single selected Bone. Select a single object (anything except objects with Targets), press button, select an Axis to align and Perspective/User view mode and press OK to align the view to the object or cancel to reset to the original view (as well as possible). NOTE: This script CAN be used as Toolbar, QuadMenu or Shortcut ActionItem! 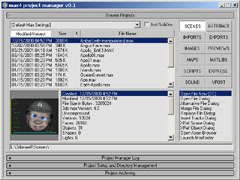 A 3ds max 4 version of the R3 script (which used to be a RCmenu). 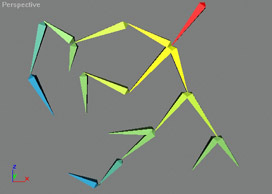 Select a single geometry object, click button, pick a normal on the surface of the object by clicking and holding the mouse, release mouse to set view. Takes the material in MEdit slot #1 and makes it the default MeditMaterial on MAX startup. Replaces all 24 materials in the MEDIT.MAT library. Creates an incremental backup copy of the MEDIT.MAT so nothing is deleted. Also adds a leading zero to Default names for better sorting. Includes a second MacroScript called MEditDefaults which loads the current version of MEDIT.MAT in the Material Editor.